Are you looking for a successful Career Change at 30 or 40? Do you look back at the last 10-20 years of your career, wondering how you got to a point where you’re successful from the outside, but inside you’re feeling stuck and unfulfilled? Career change at 30 or 40 can be scary, because we feel we’ve put a lot on the line to work our way up in our career, and risking all this in pursuit of something better and more fulfilling, when we have NO idea what that could be, is overwhelming and scary. I know so many people who have worked incredibly hard to achieve what they thought was a respectable, rewarding career they could feel proud of, only to realise this isn’t what they wanted at all. The fact that they’re now great at their job and earning good money, makes considering a career change even more complicated. If this is what you feel, you’ve come to the right place. Pursuing a successful career change at 30 or 40 is absolutely possible, and you furthermore have some advantages that someone in their 20s does not. Usually the biggest obstacle standing in the way of making this happen is ourselves. I’m going to tell you how you can approach the challenge in a way that gets results, by working your way through 3 stages (while having fun with it). Do you recognise the feeling of your thoughts at night going around in an endless loop, and you trying to think your way out of the situation? Most people get stuck in the thinking and analysing phase for way too long. Don’t blame yourself, this is particularly common if your day job revolves around problem solving and data analysis, or if you’ve been in the same career for many years. Most people are stuck at the ‘thinking level’, and are therefore constantly experiencing the dreaded ‘analysis paralysis’. If this is you, you need to start tackling the ‘creating & experimenting’ and the ‘happening’ levels. Unless you are extremely introverted, it’s likely that you are going to gain a lot more wisdom, ideas and connections through other people, compared to just scouring the web. Plus it’s going to be infinitely more fun. Think about who you know whose transformational story from A to Z you’d love to hear more about? Or maybe you know someone who is connected to a few interesting people that work on a project that sounds fascinating? Be curious and humble in your approach, and invite that person for a coffee or a 10 min phone call. A great opening question could be ‘What’s your story?’ or ‘How did you come to be here?’ which sets off the conversation in a very creative way. Whenever you’re seeing your friends, family, even your neighbour, be open and chatty about the fact that you’re on an exploration. Most people love to talk, especially about other people who are doing cool stuff, so have as many conversations as you can, and keep an open mind. Warning: Don’t fall into the trap of thinking that at this stage you need to be able to see how this could lead to a job. Remember you’re still in an early ‘inspiration and ideas stage’, so the aim is just to gather ideas and get connected. Accept the fact that your upcoming career change is going to be an expedition, not a day-trip. And very importantly…. Do not worry that you have to quit your job in order to get started! When you look back at your career history, it’s likely that you are somewhat blind in your view of the world of work. Especially if you have been in the same career for ages, you’ll have surface-level visibility of some careers, and no visibility at all of other careers. Try to be excited about the learning journey ahead of you! We all want a simple, direct line to that perfect position, but accept that this is probably not going to happen. And that’s okay, because you can (and probably should) stay in your day job while you’re experimenting. Now, from the first stage ‘Making meaningful connections’, you will have started reaching out to people, and gotten used to bringing up the topic of your ‘expedition’ at all social occasions. Through doing this you will likely have gotten a few ideas, and maybe a couple of small insights. (Don’t expect major lightbulb moment just yet). It’s time to act on these! Are there any evening events or courses you think would be fun to attend? Did anyone connect you with someone who is now able to connect you with someone else? Did anyone recommend a book you should read? Follow where all these clues are leading you, and remember to have fun while doing it. In fact, you should only follow clues that intrigue you on some level, don’t feel forced to accept introductions that don’t feel right. From my experience working with clients, the time in stage 2 takes anything from a couple of months to 6 months. Don’t rush this phase, and don’t worry about any of your learnings being wasted. A lot of the clues you follow will end up feeling like ‘dead ends’, but that’s part of the process. The point is not just to learn more about what you find interesting and intriguing, it is equally to be able to cross things off the list, that would have otherwise played at the back of your mind and nagged you in the future. You know you’re ready for stage 3 when you start having small insights as to how a newly discovered interest could potentially transform into a new career. 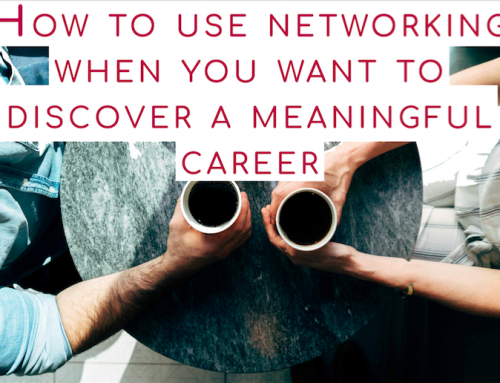 You should now start to connect the dots as to how a new exciting field, sector or profession can build upon some of the skills you’re bringing with you from your previous career. At this point, you will have learnt enough about yourself and your likes, dislikes, strengths etc., to be open and even draw opportunities towards you, that would have gone straight past your nose in the past. But to get to this stage, you have to go through the earlier stages first. If you want to learn more about how you can combine what you love doing, what you’re good at, what you can be paid for and what the world needs, then read my article 3 Powerful Strategies to Develop Ikigai (fulfilment) in your Career. In today’s job landscape, the most successful and fulfilled people are often the ones that manage to blend their experience and learnings in two or more different fields. Having 10+ years work (and life) experience means you’re in a much stronger position to position yourself to be uniquely and strongly straddling two or more of these universes than a younger person. Gaining the insight that allows you to find out where this collision happens for you, requires you to seek out active learnings. I hope I have given you some confidence that you can achieve a successful career change in your 30s and 40s. Focus on making new connections to inspirational people, and follow interesting clues without, at first, thinking about how they translate into a new career. Embrace the learning experience. Be excited about it, accept that it’s going to take time and that there will be several dead ends. Be ready to connect the dots of newfound interests with your previous skills, and what you have always liked and been good at doing. If you you could use some extra help with accountability, new ideas and keeping you on track, I’d be happy to talk to you about how career coaching can accelerate your journey.